This fun trail requires a permit, but it’s free. A fun, scenic SUV trail conveniently located close to Phoenix, Mesa and Apache Junction. Due to recent maintenance, we found the trail easier than previous drives; however, future erosion could restore it to its former moderate rating. Trail requires a special permit, but it’s free. The permit gives you the combination to unlock the gates. Call the Mesa Ranger District (number at right) for details. Open to unlicensed vehicles. Use designated routes only. Dispersed camping allowed. A few steep spots with minor ruts. Suitable for any 4-wheeldrive SUV on the day we drove it. I started this trail as listed in the book starting at the Blue Point entrance. My update is that this is in no way an easy trail. The trail should be updated. The sections between waypoint 1 and waypoint 3 are for sure not suitable for a stock vehicle. There are some spots near the end of the trail as you get closer to the Cottonwood entrance that is more difficult as well. I would rate this trail as Moderate. The most difficult parts of this trail are the most scenic. Amazing views on this trail and in my opinion really worth doing especially if you appreciate scenic beauty. Could be considered “MODERATE.” Please read Paul’s review below. I entered the route at the Blue Point Entrance. Easy grit surface, as shown on your 3 photos, constituted half or less of the road surface from quite soon after the start. More typical was exposed embedded rocks, loose rocks of significant size, and gouges and ruts, requiring constant assessment and vigilance. I found an optimum speed to be about 8-10 mph or less. Rocks of sufficient projection to be able to damage the underside of the vehicle were constantly present. About 3 miles in, I came to a steep heavily rutted short hill with numerous seriously projecting rocks, loose grit – difficult to even keep your footing – and deep gouges and holes – traction robbing. A party of 3 jeeps coming towards me, had stopped at the top to assess the hill. Still at the bottom, I backed up to let them pass. They then proceeded down carefully, one by one, then stayed to help me to get up the hill. It took me 8 attempts over 20 minutes to conquer this hill, and I consider myself lucky to have pulled it off, though experience played a big part. My considered opinion is that there is no way this could be described as “EASY”, it was more properly describable as “MODERATE”. An average driver, in say a standard 4WD Ford Explorer, would never have got up this hill, and if by chance it made it, would almost certainly have sustained serious damage. I therefore suggest that it should NOT be classified as “EASY”. The rest of route 10 to the 7.5 mile mark T intersection, continued to be challenging, requiring constant weaving and careful driving, and stopping a few more times to assess optimum routes, but nothing that worried me too much, compared with that earlier hill, and nothing that I thought would stop me for long. However, I would still classify much of it as “MODERATE”. To me “EASY” means not needing much experience, few worries about vehicle damage, and conditions allowing you to divert your eyes occasionally from the road surface - this was not Route 10. After the T at 7.5 miles, the dirt road was comparatively a piece of cake, definitely “EASY”, at least as far as the Wolverine Gate, where I exited. January 24, 2018 I drove the trail starting at the Wolverine entrance heading north on #10 to the Blue Point entrance. Total time was 2 hours and 15 minutes for 8.4 miles including time to unlock and unlock the gates. The moving average speed was 4.4 mph in a Jeep Wrangler with a 2.5 inch lift. I would not have wanted a less capable vehicle. Sections of the trail were definitely Moderate in difficulty, especially the steep uphill approximately 2.5 miles north of the wolverine entrance. I barely made it up the hill with careful tire placement and significant tire slippage and side slippage. The southern 2/3 of the trail was very rocky and line and tire place was critical to avoiding body damage or bottoming. This is now much closer to moderate than easy, base on my trips on the many othe trails rated as easy by the authors. As stated in the book, this trail was previously rated as moderate, prior to grading and the authors trip in 2012. It's my opinion the the trail has now eroded to its previous moderate rating state. I plan to run this trail again soon in a UTV (Can Am Maverick 1000 with 14" suspension travel). 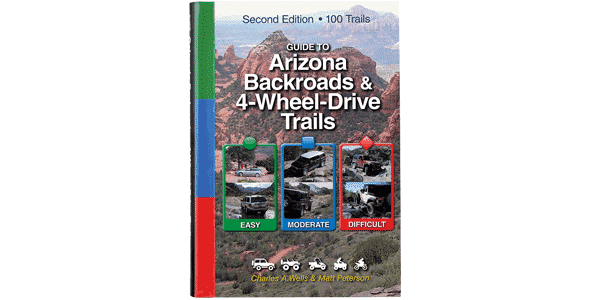 Based on my experience, and watching RZR's on this trail during our Jeep ride, this trail will be really fun in a UTV and the the loose steep uphill section much more fun and not much of an issue for a UTV in 4WD.